Rhode Island. She currently lives in Detroit. 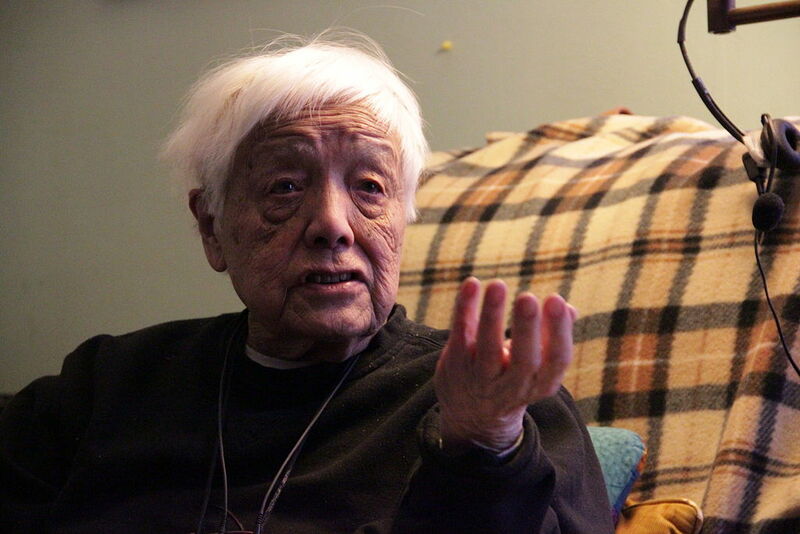 On June 27, 2015, Grace Lee Boggs turned 100 years old. Boggs is a Chinese-American writer, philosopher, and social activist, and author of several books. Her autobiography, Living for Change, was published by University of Minnesota Press in 1998. Boggs has been actively involved with historic social movements including the civil rights and the Black Power movements. Her passionate belief in a better society remains unchecked, and the words she published almost 20 years ago have tremendous resonance with race and activism in the United States today. 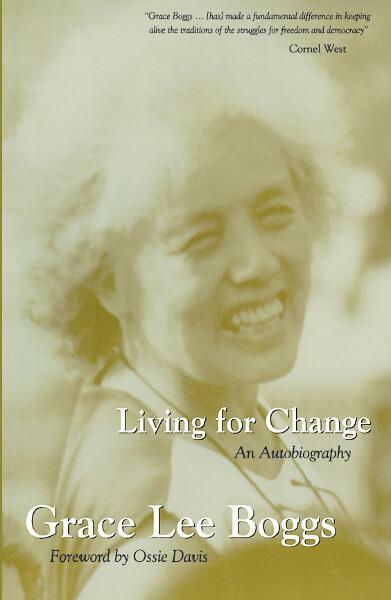 Excerpts from Living for Change: An Autobiography by Grace Lee Boggs. [On growing up in New York] We were the only Chinese in our neighborhood, and everyone we met or had anything to do with—our neighbors, classmates, and teachers—was Caucasian, a good many of them immigrants from Europe or their children. During this period it used to infuriate me when not only my peers but teachers and other adults would ask me, "What is your nationality?" I would reply patiently, as if giving them a civics lesson, that my nationality was American because I was born in the United States but that my parents were Chinese. But no matter how often or how carefully I explained, I would be asked the question again and again, as if to say that I could not be Chinese and American at the same time. Often the questioner, having heard my explanation, would go on to say, "But you speak English so well." It was said sweetly, as if I were being paid a compliment. But the message behind the sweetness was that being Chinese and speaking English well were just as incompatible as being Chinese and American. When I was in the class of 1935 at Barnard the only people of color on campus were Louise Chin and I, and a Japanese woman, Grace Ijima, of the class of 1934. In the spring of 1995 Louise and I attended our alumnae reunion. It was my sixtieth—and also my first. One of the reasons I decided to attend was that a special alumnae of color reception was on the program. At the reception I learned that today more than 25 percent of Barnard students are Asian and that there are similar percentages at many other colleges and universities. Asian students are now the largest ethnic minority on the University of Michigan campus, and the West Lounge in the South Quad Residence Hall has been renamed in honor of Yuri Kochiyama, the Japanese-American human rights activist who cradled Malcolm's head in her lap as he lay dying on the stage at the Audubon Ballroom in February 1965. Equally interesting, an estimated 50 percent of Asian young people now marry non-Asians, mostly Caucasian but sometimes African American or Hispanic. What that means for the future of this country I cannot begin to imagine. But one thing is for sure: whoever still believes that East is East and West is West and never the twain shall meet is not ready for the twenty-first century. I had participated in enough movements to know that no one can tell in advance what form a movement will take. Movements are not initiated by revolutionaries. They begin when large numbers of people, having reached the point where they can't take the way things are anymore, see some hope of improving their daily lives and begin to move on their own. I have also learned that if you want to know what a movement is going to be about, you should keep your ears close to the grassroots to hear the "why" questions that people are asking. For example, during and after World War II when black folks had acquired a new self-confidence from working in the plant and fighting overseas, they began asking, "Why do white folks treat us this way?" with a new urgency, and so the civil rights movement was born. In the 1960s, when white flight to the suburbs made blacks the majority or near-majority in cities like Detroit, people began asking, "Why are all the political leaders in our city still white?" giving rise to the Black Power movement. At the 1992 futuring conference [at the University of Michigan] I created a vision of Detroit Youth in the year 2032. A record-breaking snow storm had occurred on the eve of the celebration of Martin Luther King's 103rd birthday, I wrote, but people had no trouble getting to the celebration because young people, organized in Youth Block Clubs, had assumed the right and responsibility to keep the streets clean and safe for the community, especially elders. The vision goes on to describe how community work had been incorporated into the school curriculum, so that elementary schoolchildren working with elders were growing most of the food for the city while middle and high school students were doing most of the work of preparing and serving food in the community, and so on. Having that vision in my head and heart since the futuring conference has helped me time and again to project youth activities that transform young people at the same time that they improve the community. Grace Lee Boggs is a first-generation Chinese American who has been a speaker, writer, and movement activist in the African American community for more than 70 years. Her autobiography, Living for Change, was published by University of Minnesota Press in 1998.